I’m sure that fuel cell and all ecology and energy management can be boring for you. You’re not sufficiently rich to by the wonderful Toyota Mirai (yet), but you can have a miniature one. Well in true, I’m going talk about something funnier : a remote controlled car ! Horizon Fuel Cell Energy is working on divers areas, from aerospace/defence to educational systems. And today,… we’ll talk about a car using hydrogen to move. The idea of the concept is to show in a miniature system, the entire cycle of energy : the car is send with a solar plan which generates electricity, a hydrogen generator central changes this electricity into a gaz, and with a simple pressure, the user feed the car of hydrogen. And of course, a fuel cell permits to generate electricity for the car ! This kit is a funny way to explain the concept of hydrogen economy. The i-H2GO car needs 50secondes to get charged, and permits to run for 10minutes, while the recharge station needs 10hours to be charged by the solar plan, and only 5 hours by USB. And one charge of the station permits 10 charges of the car. Yes, this seems very long, but just think that this kit is not expensive at all, the materials mustn’t be the noblest ones. After the cars, place to the drones ! Great car! It is a good idea and it’s very cheap.What is the maximal speed of this car? The car driving looks very fun! But the best part is the hydrogen generator. 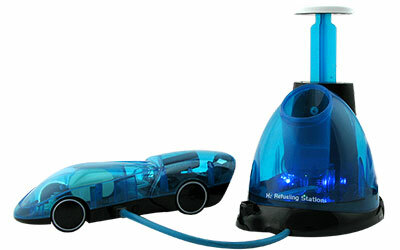 You can use the hydrogen for other purpose like a mini airship. (not a good idea to build a full size airship with hydrogen). Can you get me one for 20€ ? So how awesome is it 😀 ? You’ll see soon a video of my test, and i’m going to spoil but honnestly : i think it’s a legen…dary toy ! Would you like to work in the field of renewable energies ? Yes, it would be so exiting to work on this environnement friendly project !